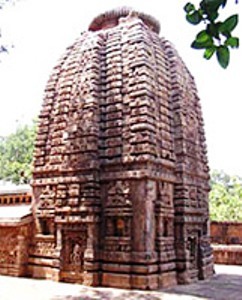 Sari Deul Temple An ancient shrine situated in Bhubaneswar, the Sari Deul Temple is an outstanding example of a Sapta-Ratha temple, is noted for its intricate carvings. The presiding deity here is Goddess Parvati, the consort of Lord Shiva. Its art and architecture indicates belong to the Ganga period. The temple has a narrow courtyard which is enclosed by a low compound-wall. Its ornamented balustrade windows on the south side are relieved with dancers and the north with musicians. The niche above the south window depicts a royal procession with the king seated on an elephant and surrounded by infantry, cavalry and elephants.